7:00am — Breakfast, which included a hunk of Constant Bliss from Baley Hazen; they offered yogurt, but it was LITE Dannon cups…ouch! 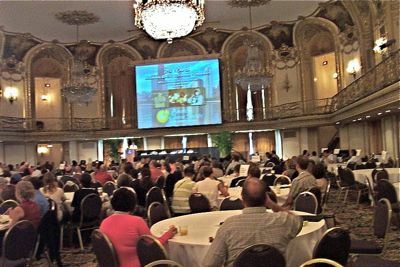 We met in the Grand Ballroom of the Chicago Hilton, which is over-the-top ornate with ten crystal chandelliers, gilding on the extensive plaster work, ruffled dra[es, and a real mezzanine balcony overlooking the floor. 8:00am — Alison Hooper, President of the ACS and owner of Vermont Butter and Cheese welcomed us, together with the Chicago director of cultural affairs who brought greetings from Mayor Daley. 8:30am — We watched the “Looking Back Looking Forward” documentary. 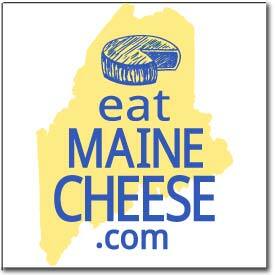 The take home message: “It’s all about the cheesemakers!” Yea! 9:00am — A round-table talk about Then and Now with Christine Hyatt, Ricki Carroll, Allison Hooper, and Paula Lambert. In response to a question about getting cheesemakers more training, Allison Hooper gave a “shout out” to the Maine Cheese Guild for our education programs, including our arrangement for a cheese focused trip to France in 2009! 10:15am — Understanding Butter Flavor and the Butter Consumer with MaryAnne Drake from North Caroline State University (including a tasting). This was an intense dive into the world of scientific product evaluation from a taste perspective, focusing on butter. We learned about the difference between consumer testing and flavor analysis using trained experts. We learned that, in terms of flavor, “cheese shouts, but butter whispers”, and we learned that most butter in storage suffers from attracting Volitile Organic Compounds that add a stale “refrigerator” flavor, rather than actually going “rancid” and that wrapping butter in foil helps to prevent this. We finished with a tasting of five very different butters. Yum. Marc Druart Spins A Tale Of Coagulation 1:45pm — Demystifying Rennet and Coagulants which was supposed to be with Paul Kindstedt from VIAC, but he was stuck at an airport on the East Coast, so Marc Druart filled in with his familiar humor and vivacity, together with candy for people with questions. Despite the short notice for filling in (one hour!) he “happened” to have a coagulant slide show on his computer, and together with Dave Potter from DCI, they gave a very illuminating presentation on the mystery of coagulation, primarily with rennet. They explained (down to the chemical details) the differences between the various animal, microbial (GMO and non-GMO), and true vegetable (cardoon, fig sap, etc.) rennets, and how their use (and misuse) can affect cheeses at all stages of production. 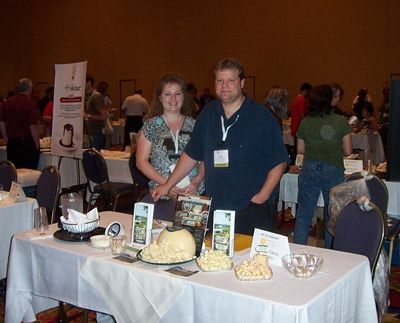 4:00pm — Meet The Cheesemaker was held in the International Ballroom (ornate by no chandelliers or mezzanine) with 64 different cheese producers showing off their wares, including Mark Whitney from Pineland Farms. I had to be careful not to fill up on cheese before dinner tonight, but I did sample a “few” of the cheeses, concentrating on the Blues (for market research). The most interesting of all the cheeses was Moo Cheese/Lucky Layla Farms from Garland, TX who make traditional Central and South American cheeses and dairy spreads from Guernsey and Jersey cows’s milk. One of their spreads is a “caramel” sauce of milk boiled down until it’s chocolate brown, then sweetened with sugar. I had met Edgar, one of the cheesemakers at Moo Cheese, at lunch and he told me it’s customary to spread the caramel over their fresh cheese (which is pressed and molded). I tried the combination and enjoyed the mix of sweet and fermented flavors. Cheese never ceases to surprise! Posted in Guild and tagged ACS, Butter, Rennet.